The IoT Fest is a one-day event organized in CEE countries by the community of IoT creators and supported by Slovak Telekom. Our speakers are experts in the field of the Internet of Things. Their PRESENTATIONS answer the hard questions which IoT businesses ask every day. IOT SHOWROOM is a great chance for startups, students and hackerspaces to show their IoT projects and prototypes to wider audience. IOT WORKSHOPS give the possibility to gain some practical knowlegde in the field of the Internet of Things. Turn your visions into reality under the watchful eyes of our specialists! How to build an IoT solution in Slovakia that fit? How to create an IoT prototype? Explaining IoT and Industry 4.0: Adventure. Meets. Technology. This workshop is going to be a basic introduction to the complete IoT architecture - starting with physical sensors and actuators, through edge filtering and automation on a gateway, to connecting to the cloud. We'll connect some sensors from the Grove IoT Developer kit, get to know MQTT protocol, Node-RED automation tool and DeviceHub cloud platform. Do you think about building IoT solution? Do you need help in setting real expectations, goals and feasibility issues? Jan and Marcel will guide you through business and technology issues related to IoT projects. Marcel Hecko, Moire Labs s.r.o. Anton will present a short introduction about building automation systems and then he will show us a real example of a complex IoT solution for SmartHome. IoT Fest in Bratislava organized by the initiative of IoT creators and supported by Slovak Telekom. IoT creators want to share, discuss and explore ideas, knowledge and experience connected with the Internet of Things. They form a strong community of startups, professionals, developers, makers, experts, students and IoT enthusiasts. IoT creators are proudly supported by hub:raum powered by Deutsche Telekom. This ticket enables you to take part in PRESENTATIONS AND SHOWROOM at the IoT Fest Bratislava. Do you have an IoT project? Register and reserve a meeting with hub:raum team to talk about the IoT opportunities and hub:raum tailor-made programs for you. BRING YOUR IOT PROJECT TO SHOWROOM! 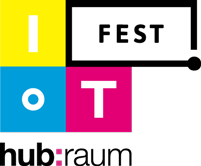 Apply for IoT Showroom at the IoT Fest Bratislava. If you are from a scientific circle, startup or a company operating in the area of ​​the Internet of Things and want to show your solutions and products to a wider audience - we are waiting for your application. The number of places is limited. The organizers reserve the right to choose the projects for the IoT Showroom. WAITING LIST for the WORKSHOPS: IoT architecture introduction and edge automation (Paweł Kazimierowicz, Intel). You are on the WAITING LIST FOR WORKSHOPS: Let’s build an IoT Solution! Feasibility consulting (Jan Masaryk, MAKERS s.r.o. & Marcel Hecko, Moire Labs s.r.o.). WAITING LIST FOR WORKSHOPS: Control systems for building automations (Anton Pytel, MAKERS s.r.o.). Apply for the WORKSHOPS: Let’s build an IoT Solution! Feasibility consulting (Jan Masaryk, MAKERS s.r.o. & Marcel Hecko, Moire Labs s.r.o.). The number of places is limited. Apply for the WORKSHOPS: IoT architecture introduction and edge automation (Paweł Kazimierowicz, Intel). The number of places is limited. Apply for the WORKSHOPS: Control systems for building automations (Anton Pytel, MAKERS s.r.o.). The number of places is limited.